Perched on the remains of his conquest, this blue and purple dragon roars defensively at any who approach. The Blue Dragon on Castle LED Snow Tube depicts this dragon in high detail atop a glowing tube filled with spinning glitter. 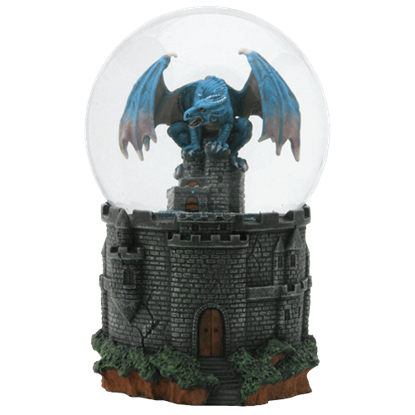 A new king has ascended to the throne and will rule with fire in the Blue Dragon on Castle Snow Globe. Hail the new king and be thankful that it will only complement your homes current theme instead of incinerating it. 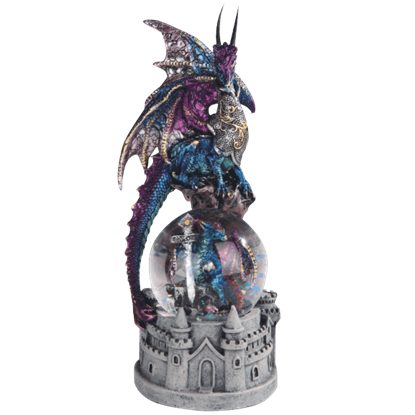 With regal elegance, the Blue Dragon with Castle Base Snow Globe displays metallic details amongst shades of blue and purple, making this hand painted statue a majestic sight to see and a marvelous addition to fantasy home decor. 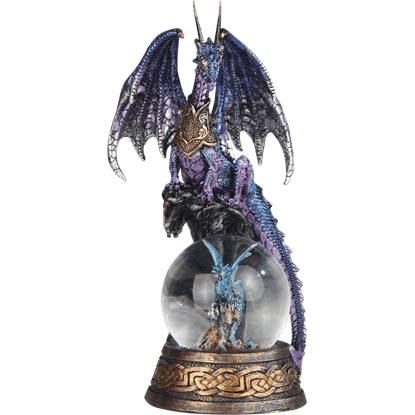 A masterful fantasy collectible for dragon lovers, the Blue Dragon with Dragon Snow Globe features a sculpted dragon perched above a glass ball with another dragon inside of it, all standing on a base with intricate knotwork detailing. Perched upon its mysterious treasure, the dragon opens its jaw in a snarl towards all who gaze on it. 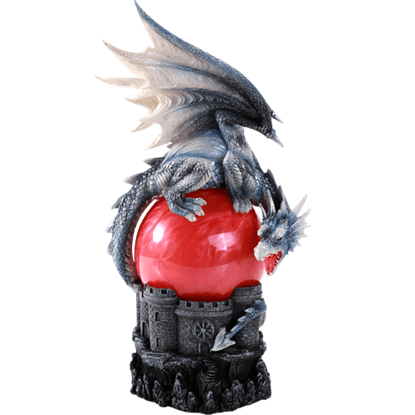 The Castle Dragon Storm Ball Statue depicts this scene in high quality polyresin with stunning, hand painted detail. Reptilian eyes glint in annoyance. The ferocious dragon glares upon the fool who interrupted its restful slumber. 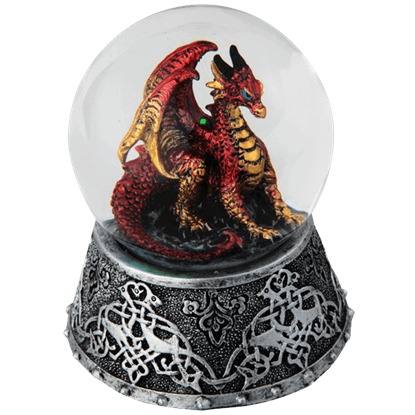 The fiery red beast perched within the Celtic Fire Dragon Snow Globe does not tolerate intruders. The dragon maintains the motionless stance of a sentinel. Its stern gaze settles on those who dare encroach upon its territory. 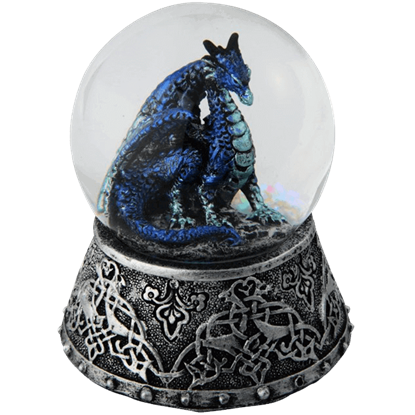 Admire the serious devotion of the guardian dragon enclosed within the Celtic Ice Dragon Snow Globe. The archer preps the crossbow. Fierce gleaming eyes narrow on the alleged ambusher. The crossbow falls, quickly forgotten. 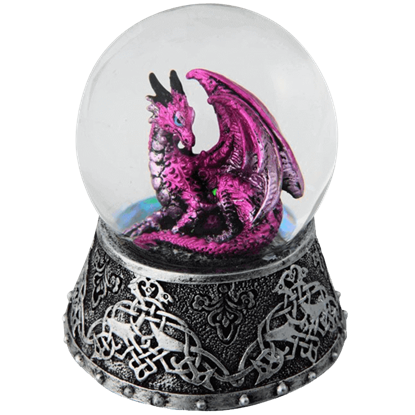 The beast encased within the Celtic Purple Dragon Snow Globe observes with annoyance as another fool flees. If you have been looking for a unique and new item to add to your dragon decor, then your search is over! 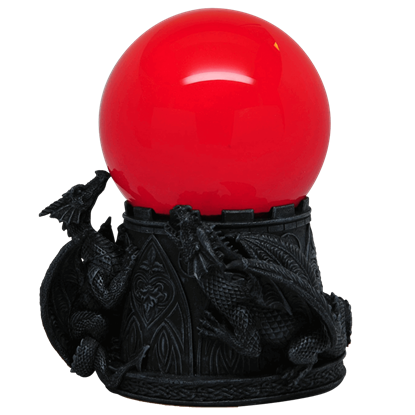 This Double Dragon Sandstorm Ball is an intriguing decoration that is sure to attract attention every time someone goes near it! Upon a castle base, a statue of a dragon holding a cross and dagger appears within a globe. Regal and calm, another dragon gazes down at the scene. 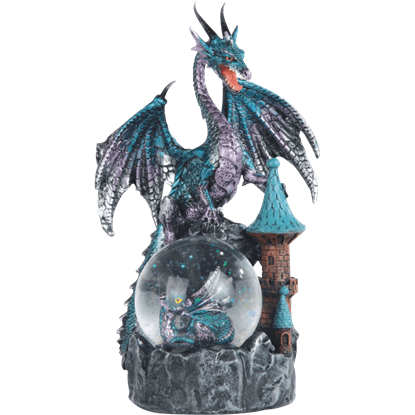 The Dragon and Cross Snow Globe with Castle Base depicts this intricate arrangement. 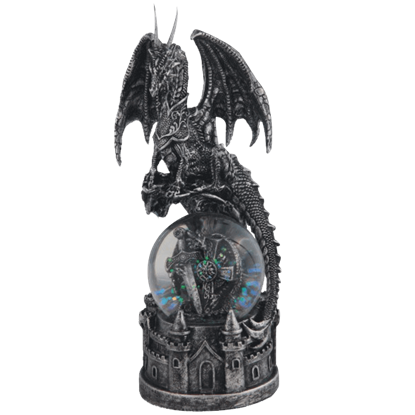 Hand painted to resemble fine metal, the Dragon and Sword Snow Globe with Castle Base is a beautiful addition to any fantasy themed home or dragon statue collection. 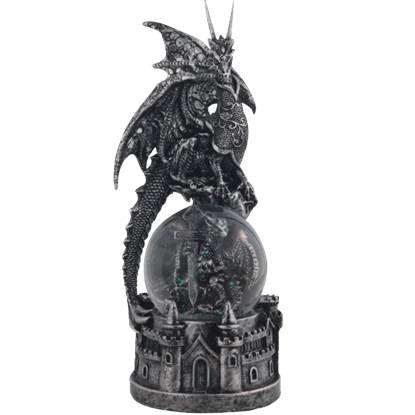 Within the snow globe is a figure of a dragon holding a mighty sword. 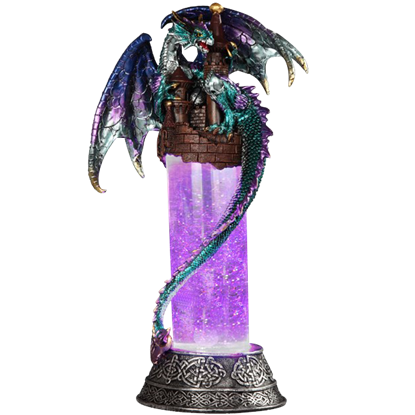 If dragons and water do not seem to go together to you, then it is time to think again, as this Dragon Castle Water Globe is a remarkable accessory that combines a powerful blue dragon with the design of a decorative water globe.